Boss Martin O’Neill praised young academy graduate Ryan Yates after the midfielder starred on his debut in the 2-0 home win over Brentford. The midfielder was part of a solid performance that saw Forest score in either half — through Lewis Grabban and debutant Molla Wague — before a late Brentford fightback. However, it was not enough to stop Forest getting back into the play-off race, despite squandering a second half penalty. He said: “There were some terrific performances out there today, especially young Ryan Yates who I thought was fantastic. “I’m delighted for Ryan. He has been exceptional in training, his enthusiasm is immense and he desperately wants to play for this football club. He’s taken his chance today and he’s done very well so I’m hugely pleased for him. 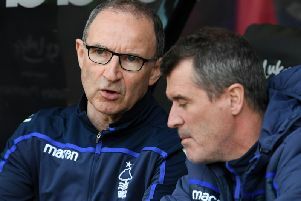 O’Neill was a winner for the second time in charge of the Reds after Grabban collected Alex Milosevic’s ball over the defence and held off a challenge before getting away a shot. His first effort was saved but Grabban tucked away the rebound to make it 1-0 after just 16 minutes. Grabban was denied a second from the penalty spot and Bees keeper Daniel Bentley made another fine stop to keep out Ben Watson’s follow-up. However, substitute Wague headed in Joe Lolley’s corner to double the Reds’ advantage before Sergi Canos poked in two minutes from time to set up a nervous finish. O’Neill added: “I’m delighted to have won the game. It was a very difficult match against a very fine footballing side in Brentford. We had some really good opportunities, particularly Leo Bonatini’s chance to make it 2-0, but thankfully we got that second goal in the end. “We had to survive some nervous moments at the end but thankfully we did and I’m delighted with the victory. There was a 10-15 minute period in the first half where we allowed Brentford to dominate and we allowed them to play through us but we rectified that in the second half. “The onus was on us to get forward from the first minute and I think we did that. We made a tactical change at half-time because Leo Bonatini was looking a little bit tired and we thought we may benefit from some fresh legs. “I have seen a lot of Brentford in recent years and they are a very fine football side.